Once again, I'm suffering from another bout of insomnia. It's past 4 a.m., and I'm exhausted. But I cannot get to sleep. I'm now trying the cure of last resort - reading old college textbooks. So far I've gotten halfway through The C Programming Language, Second Edition and I'm just starting on Design and Analysis of Integrator-Based Log-Domain Filter Circuits. I'll let you know if they do the trick. Over the weekend I hung out with an old friend from childhood who was in town visiting. This guy is a brilliant trumpet player. From a young age, we all knew he was destined for greatness. He went off to a really famous conservatory to study music. He was a brilliant success there, and since graduating, he's done really well for himself, finding a lot of professional success performing and teaching. But during this visit, he was very excited telling me about the fabulous new part-time job he's found to supplement his income. "It's great, easy and pays really well!" he exclaimed. He's working for one of those medieval-themed restaurant/theme parks. So every night, he puts on a chain mail shirt and helmet, and climbs up into a little tower in the middle of an arena. He sits there alone most of the night, reading a book. Except that every 30 minutes he stands up, picks up his trumpet and plays a loud fanfare while the knights ride out on their horses and get ready to joust each other. Then he plays another fanfare whenever the champion is declared. Oh, and he gets to eat as many humongous turkey drumsticks as he wants. Well, the generic Tussin did its best, but in the end I succumbed to another nasty cold. The second in under two months! What's going on? Has my approaching-middle-age body given out on me already? 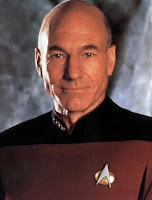 After watching four back-to-back episodes of Star Trek: The Next Generation on tv tonight, we did feel better. Maybe it was Dr. Crusher's soothing bedside manner that did it. 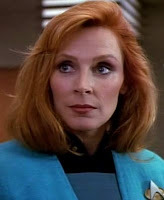 Although it's always bothered me that Dr. Crusher never wears a doctor's coat or has her hands covered in blood, like most doctors do. And her hair is always perfectly coiffed. She uses that little handheld Nintendo Game Boy-looking thing to diagnose her patients. She never has to touch any of them! And she can always exam everyone fully dressed. Nobody ever has to take their clothes off and put on that paper nightgown for Dr. Crusher. For the past several months, the Husband and I have been buckling down to pay off some debt and save some money. We've been putting ourselves on weekly budgets, packing our lunches, and trying not to go out too frequently. Earlier this week, we both came down with colds. I went to the drugstore to buy cough medicine. There was the fancy name-brand cough medicine. Then there was the generic stuff - "Tussin." Seeing that always makes me laugh, as anyone who's seen Chris Rock's funny video on this issue will understand. But since I'm a maniac, I wanted the absolute cheapest stuff possible. And way at the back of the bottom shelf in the drugstore, next to the enema kits, I found it! Yes, we've reached a new fiscal low - we're buying the generic generic cough medicine. I think this stuff was bottled in the 50s. But it's been working great so far. And best of all, it was super cheap! The postal worker who delivers mail to our building is a very nice lady. She comes by our building once a day to deliver the mail. But she's not what you'd call predictable. Some days she comes early, around 1 p.m. Other days we won't get our mail until much later in the afternoon. But we've figured out her pattern. Whenever Joe, the cute doorman, works a day shift, he always brings pizza for lunch. On those days, she shows up at noon on the dot to eat pizza with him and do some flirting. Those are good days to get packages. Joe is very happily married. He's a good man - he takes one for the team.